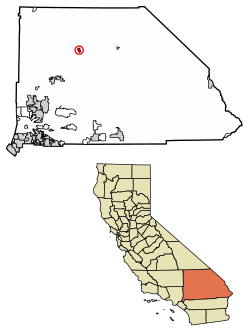 Fort Irwin National Training Center is a major training area for the United States military and is a census-designated place located in the Mojave Desert in northern San Bernardino County, California. 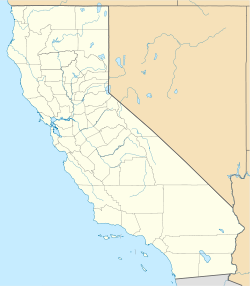 Fort Irwin is at an average elevation of 2,454 feet (748 m). It is located 37 miles (60 km) northeast of Barstow, in the Calico Mountains. The 2010 United States Census  reported that the Fort Irwin Census Designated Place had a population of 8,845. The population density was 1,254.1 people per square mile (484.2/km²). The racial makeup of Fort Irwin was 5,481 (62.0%) White (51.6% Non-Hispanic White),  1,086 (12.3%) African American, 103 (1.2%) Native American, 402 (4.5%) Asian, 120 (1.4%) Pacific Islander, 916 (10.4%) from other races, and 737 (8.3%) from two or more races. Hispanic or Latino of any race were 2,261 persons (25.6%). ^ "AFCCC Operational Climate Data Summary". 14th Weather Squadron. Retrieved 22 August 2014. ^ "Census of Population and Housing". Census.gov. Retrieved 4 June 2016. ^ "2010 Census Interactive Population Search: CA - Fort Irwin CDP". U.S. Census Bureau. Retrieved 12 July 2014.
" The Army Goes Rolling Along"